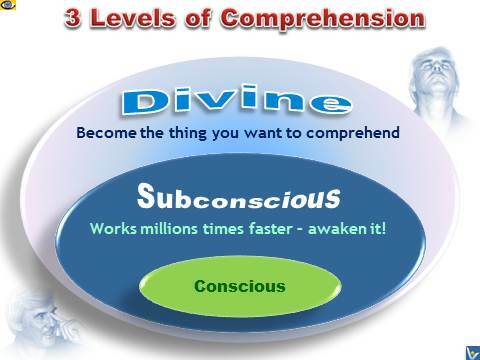 SUBCONSCIOUS MIND POWER (Inspirational Quotes). Personal Success Secrets. How To Achieve Success. because it works millions times faster. 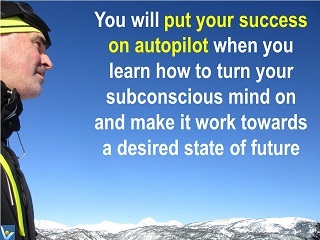 When you learn how to turn your subconscious mind on and make it work towards a desired state of future, you'll put your strategic ideation and → strategic success on autopilot. Why should you force your brain to work if your subconscious mind works much faster? 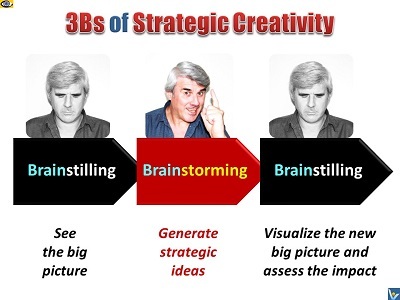 The possibilities of creative effort connected with the subconscious mind are stupendous and imponderable. 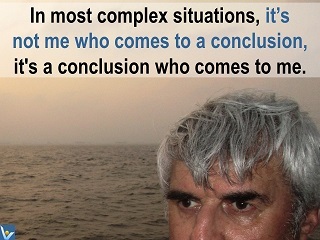 One should never impose one's views on a problems; one should rather study it, and in time a solution will reveal itself. The main factor of creativeness is the life of a human spirit, their joint feelings and subconscious creation. If you are working on a problem and getting nowhere, leave it for a while and let your subconscious – your depth mind – to take over. 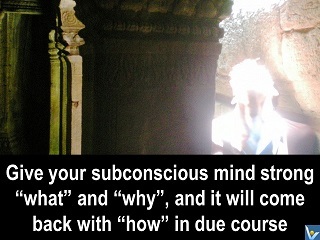 Only one thing registers on the subconscious mind: repetitive application – practice. What you practice is what you manifest. It is psychological law that whatever we desire to accomplish we must impress upon the subjective or subconscious mind. The person with a fixed goal, a clear picture of his desire, or an ideal always before him, causes it, through repetition, to be buried deeply in his subconscious mind and is thus enabled, thanks to its generative and sustaining power, to realize his goal in a minimum of time and with a minimum of physical effort. Just pursue the thought unceasingly. Step by step you will achieve realization, for all your faculties and powers become directed to that end. The law of attraction attracts to you everything you need, according to the nature of your thought of life. Your environment and financial condition are the perfect reflection of your habitual thinking. We must realize that the subconscious mind is the law of action and always expresses what the conscious mind has impressed on it. What we regularly entertain in our mind creates a conception of self. What we conceive ourselves to be, we become. Formulate and stamp indelibly on your mind a mental picture of yourself as succeeding. Hold this picture tenaciously and never permit it to fade. Your mind will seek to develop this picture! If you don't have a vision for the future, then your future is threatened to be a repeat of the past. Insight occurs just because it is high time. It takes a lot of time to be a genius. You have to sit around so much, doing nothing, really doing nothing. Your Conscious desires and your Subconscious intention must be in alignment. If your Conscious Mind wants one thing and your Subconscious Mind wants something else (counter-intention) it is impossible to create what you truly want. Sit in reverie, and watch the changing color of the waves that break upon the idle seashore of the mind. We think our actions express our decisions. But in nearly all of our life, willing decides nothing. We cannot wake up or fall asleep, remember or forget our dreams, summon or banish our thoughts, by deciding to do so. When we greet someone on the street we just act, and there is no actor standing behind what we do. Our acts are end points in long sequences of unconscious responses. They arise from a structure of habits and skills that is almost infinitely complicated. Most of our life in enacted without conscious awareness. Nor can it be made conscious. No degree of self-awareness can make us self-transparent.